Not to the good or bad—and especially not to the downright miserable. She never asks me to draw a blank. That, she says, will be asking for too much. What she wants is for me to become more comfortable with—and accepting of—my reality. Which is challenge enough. Those few minutes are revelatory. The thoughts race with each other, compete for attention, and in the process become undecipherable. It is only after three years of this practice that I have managed to start—and only start—exercising a semblance of control. It is easy for me to pinpoint when meditation became less of a battle. It was around the time I decided to embrace goalless-ness. You are allowed one double take. Then, I get to explain. My definition of goalless-ness isn’t a lack of drive. It is a resolve to live with a lack of clarity about my ambition and abandon artificial timelines to satisfy said ambition. Simply put, the pressure is off. The only race I am in is to get to the office on time. Damn you, Mumbai traffic. I am, for the most part, a Type A personality. But even I now wonder: When did slow become a bad word? To athletes, helicopter parents and cheetah moms, sure, slow is antithetical. But to everyone else, why this aversion to taking a moment longer to get from point A to point B? Anger, frustration, meltdowns, despair, fatigue: All byproducts of this need for speed. We can all do without it. 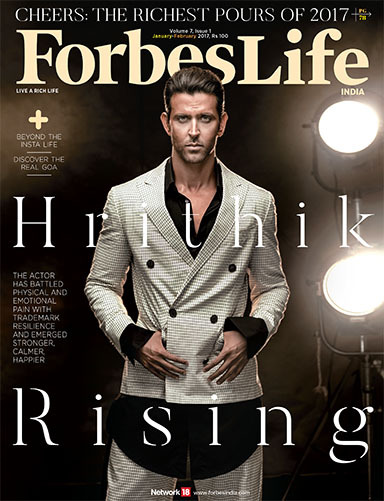 The man on the cover of this issue, Hrithik Roshan, is living by the ‘less is more’ maxim, which has given him more time for himself and allowed for greater pleasure in his work. “I am very happy with what I have, which means I now need to enjoy my work and not be stressed to earn more,” he tells Neeraj Gangal. He points out how he has done far fewer movies than any of his contemporaries or even seniors, but has no misgivings about it. “You can be doing one thing but do it so well that it counts as much as ten things.” The 43-year-old actor has overcome personal and professional trials to reach a “zen-like” state, points out Gangal, who met him at his tastefully done-up Juhu home in Mumbai. Family vacations with his children, focusing on fitness, and a one-day-at-a-time attitude have taken Roshan to a happier place. You could call him the poster boy for the slow-it-down effort. But no less compelling are the artist-travellers who, forgoing the Insta life favoured by every smartphone carrier worth her selfie, choose to sit down for hours and capture memories by putting pen to paper. Sure, many of their illustrations make it to Instagram, but without filters. The Slow Movement has entered the worlds of Indian fashion and food in tangible ways. Designers have adopted the homespun and chefs have started to embrace local cuisines and traditional cooking methods to great effect. And with climate change—nature is the biggest casualty of speed—evident in every breath we take, the case for slowing down has never been stronger.